Understand the Importance of Accessories- Accessories give a room its personality. These are the details that give off the energy of a room, tell you about the people who live there, and give you a sense of how you should feel when you step inside. For examples, if you use a potted palm in the room, it might give off a sense of relaxation since it may evoke a warm, tropical location. Meanwhile, hanging a framed concert poster tells your guests that you have an appreciation for music.There is absolutely no rule that says your accessories cannot be an eclectic mix—one that makes you think and feel a few different ways at once. You just want that room to feel inviting and lived-in.From plants to objects and art to lighting, take a look at the most important accessories and tips for arranging them in every room of your home. Bring in Plants and Flowers to Add Life and Energy – Plants in the home have become a huge design trend again. People crave bringing a bit of the outside in, from a stately tree to tiny succulents and lush arrangements of flowers.If you take a look at this online tour of an apartment in New York City, it is amazing to see how a cactus, a fiddle leaf fig tree, and other small plants make you feel completely transported. This room brings you the feeling of a zen New Mexico instead of a harried and bustling New York.In your own home, plants and flowers can be arranged and clustered or spread out throughout rooms. Not only do they look nice and add a pop of color, but they also help purify the air and can make you feel happier.When getting started, make sure you understand how much light these rooms get, and shop for plants accordingly. You do not want them to wither and die before you really get to enjoy them and see how they grow. Set The Mood With Lamps and Lighting- In this warm, cozy bedroom from French & French Interiors, it is easy to see how lighting plays an important role. From floor lamps and table lamps to sconces and statement-making pendants and chandeliers, lights set the mood in every room.Consider dimmers and lamps in rooms where you want to create a warmer, cozier feeling, and track lighting in spaces where you want the room to feel bright and open all year long. From a design perspective, do not be afraid to have some fun. Lampshades can be changed, and chandeliers and pendant lights can completely change the energy in a room. Add Area Rugs for Depth and Warmth – Hardwood floors are nice but are often overlooked. A really cool area rug can even make the floor feel like the focal point. And, if you do not have dazzling hardwood floors, area rugs are the perfect way to mask less-than-perfect flooring and take control of the warmth factor in any room. Rugs can also add depth; your eye will naturally follow the color or pattern to the end. They are also a great way to add maturity to any room especially your first place when you are just starting to get your feel for your sense of style and decor preferences.There are no hard and fast rules when it comes to rugs, but much like window treatments, they can serve as a focal point or as a soft background feature that allows other room elements to shine.The area rug in this nursery (designed by Amber Interiors) draws all the elements of the room together and makes it feel a bit cozier. Hang Art and Gather Objects- Often when decorating a space, we feel rushed to make sure it gets “finished.” But the truth is, making a room or a home feel like home, can take time. So when it comes to adding those special little touches, do not be afraid to decorate slowly. Take care and time to gather unique and interesting objects, and experiment by moving them around the house to see where they feel best.This applies to hanging art, too—let that process happen naturally and you will be happier with the results. 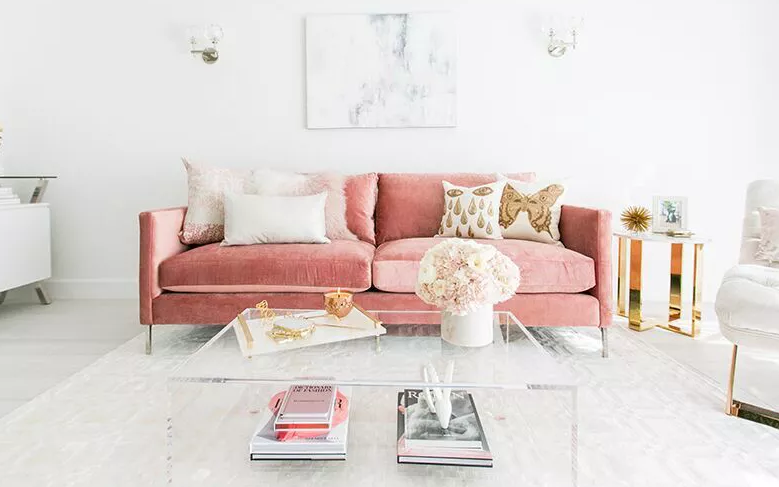 Take a look at this room, photographed for The Everygirl, which feels like a collection of personal pieces instead of an Ikea showroom. Select a Statement Piece- In this room from Kirstin Corrigan’s home tour on The Everygirl, her pink velvet couch is the statement piece. It stands apart from the airy, white interior in a big way. In your own home, you might choose to make a piece of furniture your statement piece, or it could be your carefully chosen, large indoor plant, or a big piece of art hung on the wall. A statement piece helps to anchor the room and can give you a center point around which all your other decor choices can be based. Embrace A Mix of Textures – Mix textures in every room. ​In this example, soft cashmere throws paired with a supple worn-in leather armchair might bring visual interest next to a raw wooden crate topped with a sleek mid-century modern lamp.There is really no limit to how you can combine and play with textures in your home—hard and soft, rough and smooth, you get the idea. Rugs are a part of this, as is furniture and accessories—they all work together to create depth, interest, contrast, and personality.